Pieces of history from Dodgers' legend Jackie Robinson's career can be found in the most peculiar place. While most pieces can be found at Dodger Stadium and in baseball museums, they can also apparently be found at garage sales in Iowa. The Dodgers may be one step closer to getting one of their top catchers back. Dave Roberts told reporters that Russell Martin has resumed baseball activities en route to a return from a sore back that put him on the injured list. Since the end of the 2017 season, Kenley Jansen has struggled to dominate like he used to. Should the Dodgers make a change if his performance doesn't improve sometime soon? Alex Verdugo is off to a very good start with the Dodgers but still lacks enough playing time. This article looks at some options for more playing time. 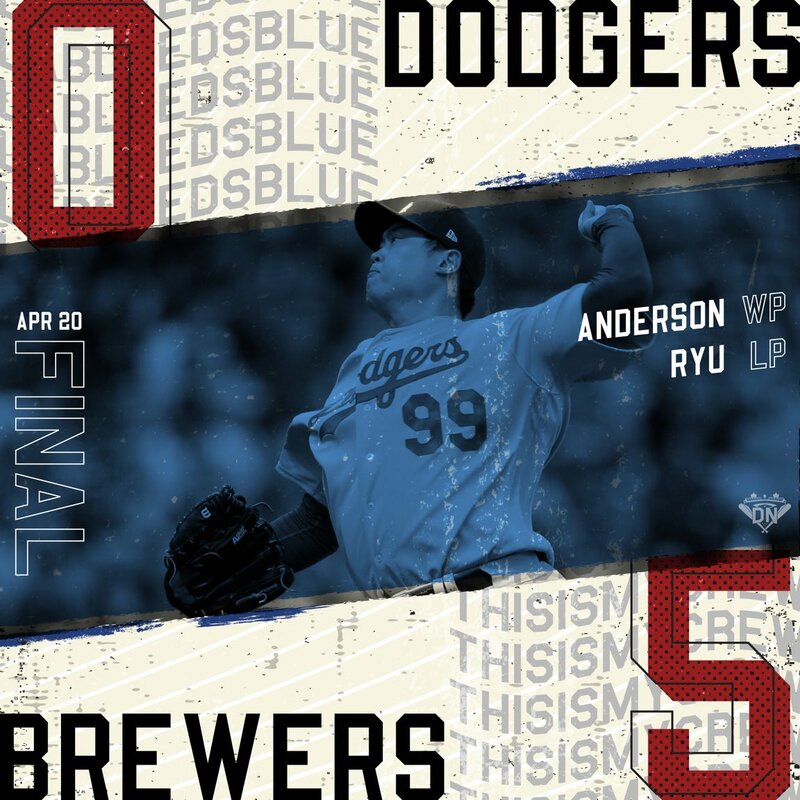 The Los Angeles Dodgers defeated the Milwaukee Brewers 5-3 at Miller Park on Friday night. Kiké Hernandez hit a dramatic home run off Josh Hader. Updates on Dodgers pitcher Rich Hill, Julio Urias' exceptional outing, another KTLA pregame show with Derrin Horton, and great starting pitching. Former Los Angeles Dodgers general manager Ned Colletti joined MLB.com's Edward Jones Chatting Cage to talk Dodgers baseball. Los Angeles Dodgers outfielder Joc Pederson talked to Pedro Moura of The Athletic about his adjustments mentally to a platoon role. The Dodgers signed right-handed pitcher Logan Bawcome to a minor league on Thursday. The Dodgers drafted him in 2010 in the 17th round. Dodgers six game win streak is snapped but they still have a great chance to win the series tomorrow when Clayton Kershaw takes the hill. This has been @BriRobitaille with play by play for today. Let's shake this one off and get em tomorrow. FINAL: Dodgers, 0. Brewers, 5. Ryu was good overall but made two mistakes to Yelich who made him pay. Braun hit a 3 run HR and the Dodgers offense was non-existent tonight. Fresse grounds into a force play and the Dodgers are down to their last out. Cody earns a one out walk.